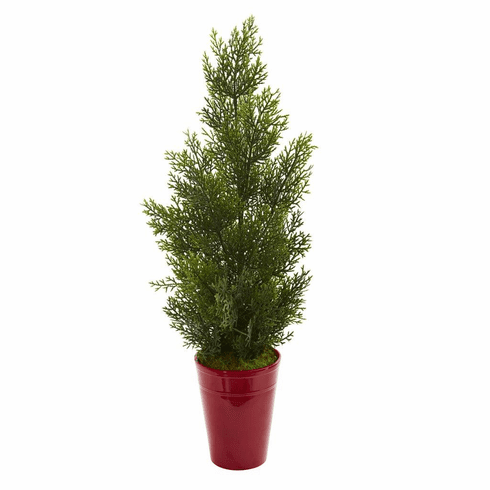 Standing gracefully in an included decorative planter, this artificial 27” mini cedar pine tree, with an abundant amount of green pine needles, will brighten any dull corners or wasted spaces in your home. Flaunting its realistic appearance, this ornament will bring the warmth of the sun and the feel of the forest indoors. Place it near a woven-wicker chair or basket for a touch of coastal appeal. Height: 27 In., Width: 13 In., Depth: 13 In., Color: Red, Pot Size: H: 6.5 In. W: 5 In. D: 5 In.